Science and politics disregard the climate lessons of Nature and mankind is failed as a consequence. Multiple studies published in peer-reviewed scientific journals show about 97 percent of climate scientists agree climate-warming trends over the past century are very likely due to human activities. Most agree the principle cause of this warming is the greenhouse effect produced by the accumulation of carbon dioxide in the atmosphere as a result of the burning of fossil fuels. From 1998 to 2013 however the atmosphere did not warm even though carbon dioxide emissions continued to rise over the same period. Further in 2010 sea level rise, which is considered the greatest risks of climate change, went into reverse and the level of the oceans dropped by 5 millimeters. It was scientists who discovered, measured and explained these events but the practical implications seems to have escaped them; with the result policy makers are deprived of the information that would enable them to address climate change with the least cost and to the greatest benefit. NASA has confirmed the warming hiatus that existed most of this century was real and that the heat that was missing from the atmosphere was instead trapped in the waters of the Pacific and Indian oceans to a depth of about 300 meters. The Pacific Ocean was the primary repository of that heat as unusually strong trade winds piled up warm water in the west, pinning it against Asia and Australia but those waters became so warm some of the heat leaked into the Indian Ocean. Kevin Trenberth of the National Center for Atmospheric Research in Boulder, Colorado says, "There's a good chance the hiatus is over." Last year was the hottest since records began and with an El Nino now under way the warm surface waters of the Pacific are releasing heat into the atmosphere with the result 2015 is likely to break last year's record and the global average surface temperature could jump by as much as 0.1 degree this year alone bring global surface temperatures increases to 1 degrees or half way to the UN global limit. Man made devices can also move heat into deep water and when that movement is through a heat engine, energy is produced. In fact it is estimated the oceans have the capacity to produce as much energy as we currently derived from fossil fuels with the movement of heat to an ocean depth of 1000 meters. There the coefficient of expansion of sea water is half that of the tropical surface and heat at that depth can no longer migrate towards the poles to melt ice so sea level rise is mitigated. Heat at a depth of 1000 meters would not return for at least 250 years because the return rate is about 4 meters/year. The 2010 sea level decline resulted from a major transfers of ocean volume to the land in the form rain as a result of a strong La Nina event. 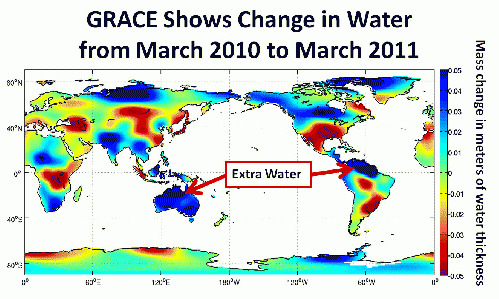 The following NASA JPL image shows how land-based water storage changed over the period March 2010-March 2011, as observed by the NASA/German Aerospace Center's Gravity Recovery and Climate Experiment (Grace) twin satellites. Energy created mid-ocean by structures that would move ocean heat to deep water needs to be converted to an energy/water carrier like hydrogen to get that power to market. Fourteen terawatts (believed to be the amount of energy that can be derived from the ocean with ocean thermal energy conversion (OTEC) devices) would convert 16 trillion kilograms of water to gas and when reconstituted on land to produce energy in a fuel cell or hydrogen burning engine would create 600 gallons of water for every person on the planet as a byproduct. There would be a tiny sea level benefit from this transfer but more importantly this water would negate the necessity to pump aquifers, which is the third element of the sea level trilogy. An electrolysis process developed by a Lawrence Livermore team also sequesters carbon dioxide and neutralizes ocean acidity. Fourteen terawatts of OTEC power would overcome the greatest concern of climate scientists by sequestering 79 billion metric tons of CO2 annually. A recent MIT masters thesis shows that OTEC energy has the highest capacity of all energy sources and the least levelized capital costs of any renewable, including nuclear power. The Practical Implication of the Global Warming Hiatus.